Hello and welcome to the 108th installment of the SWD. Faylaq al-Sham disassociated itself with the elements stationed in the northern Aleppo countryside, Liwa al-Shamal (Northern Brigades), disassociation came after several complains regarding the internal and external violations. 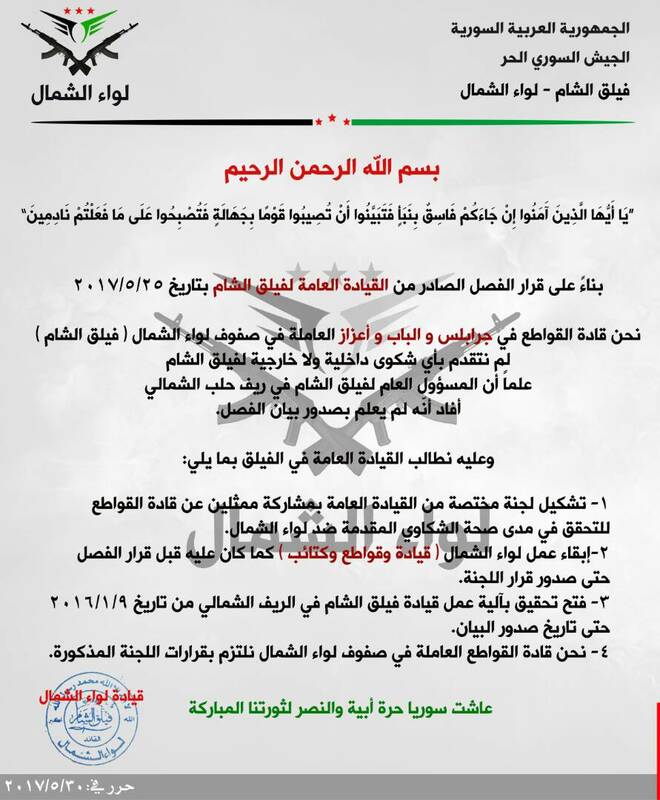 Faylaq al-Sham’s statement continues by demanding the hand over of the weapons from the captain Mustafa Rami al-Qoja, commander of Liwa al-Shamal. However, Liwa al-Shamal released a statement of their own, in it they refuse Faylaq al-Sham’s decision to expel them and demand an investigation. Liwa al-Shamal operates in Jarablus, Al-Bab, and Azaz. Three members of Liwa Ahrar al-Sharqiya were affected by an explosion of one of Islamic State’s landmines still remaining in Al-Bab. One fighter was killed while two commanders, Abu Hammam Mirat and Abu Jafar Shaqra, and the former’s deputy Abu Hatam Shaqra were wounded in the explosion. Syrian Arab Army captured Khirbat Madinat al-Far southwest of Maskanah from Islamic State in eastern Aleppo countryside. Syrian Democratic Forces captured Raqqa Samrah village last night from Islamic State at the eastern outskirts of the city of Raqqa. On the front east of Tabqa, SDF captured Abu Qubiya and Al-Hamam villages. Baath dam is also under SDF control, but the forces haven’t entered it yet out of fears of the left over IS’ improvised explosive devices. 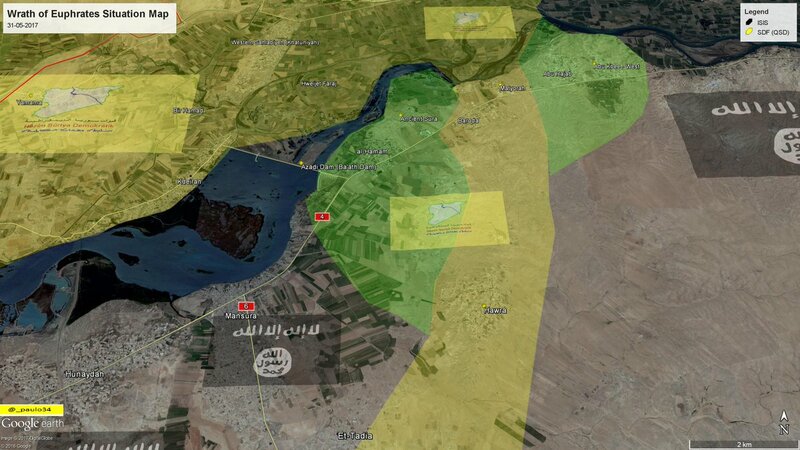 SDF will eventually enter the Baath dam, once it is cleared of explosive devices. 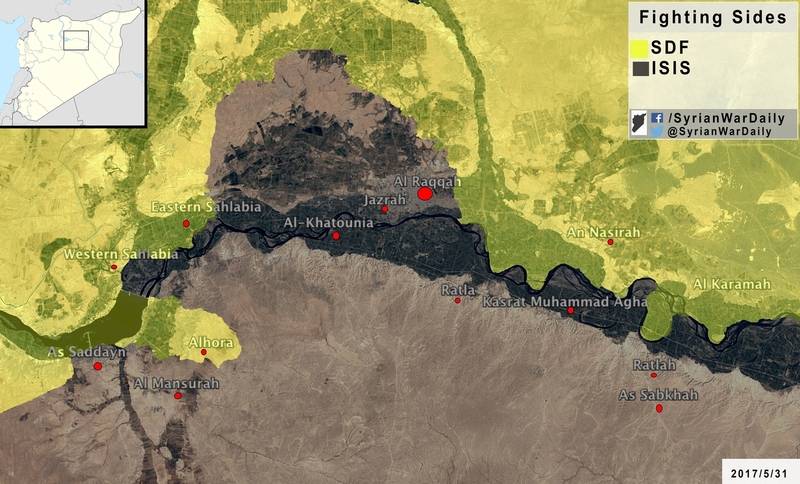 Approximate situation in greater Raqqa area, HD version of this map can be found here. Highly unconfirmed reports suggest that Iraqi Al-Hashd al-Shaabi (Popular Mobilization Units) entered Syrian territory and captured villages of Qasibah and Al-Bawari from Syrian Democratic Forces. Hayat Tahrir al-Sham allegedly cut the road between Bab al-Hawa border crossing and rebel-held areas in Idlib and Aleppo governorates. The claim about Hayat Tahrir al-Sham cutting the road was officially denied by the group. Agreement was reached between Syrian government and rebels regarding the evacuation of four seriously wounded people along with their 12 family members in Fuah and Kafraya. In return, the same number of wounded and family members will be evacuated from rebel-held part of Yarmouk camp, south Damascus. Syrian Arab Army backed by Russian Air Force reportedly started a large offensive against Islamic State in eastern Hama governorate. Clashes were concentrated around IS-held Al-Barghoutiya village, it is interesting though that the village was two times falsely reported as captured by the pro-government sources, the latest false report was on the 11th of March. Ahrar al-Sham released a statement about Faylaq Homs joining their ranks. Syrian Arab Army clashed with Islamic State south of Palmyra, clashes were intense and took place in Al-Abbasiyah area. According to several Amaq Agency’s statements, at least three SAA soldiers were killed in clashes, SAA‘s BMP and two mortars were destroyed by anti-tank guided missile, and IS’ SVBIED targeted SAA‘s convoy in Al-Abbasiyah area. CJTF-OIR‘s airstrike killed one of the founders of Islamic State’s media outlet, Amaq Agency. Bara Dakak (Kadak), known as Rayan Mishal was killed along with his daughter Lian by an airstrike in Al-Mayadeen, new capital of Islamic State. Syrian Arab Army freed three commanders and a number of soldiers which were imprisoned in rebel-held Barzeh neighborhood, the prison was found once the neighborhood was fully evacuated by rebels and part of the civilians. Free Syrian Army’s factions led by Quwwat al-Shahid Ahmad al-Abdo and Jaysh Usud al-Sharqiya launched an attack against SAA and allies near Al-Zaza checkpoint. Initial reports suggested that rebels were able to break first defense lines forcing SAA and allies to retreat to Al-Seen Air Base. However, after some time, reports about rebels’ advances died down and were taken over by the reports about Russia targeting rebels around Al-Tanf with four cruise missiles. Islamic State forced a couple of dozens of civilians from Al-Zanjili district to Old Mosul to be used as human shields, this desperate move by IS shows that they won’t be able to resist Iraqi forces for much longer in districts north of Old Mosul. 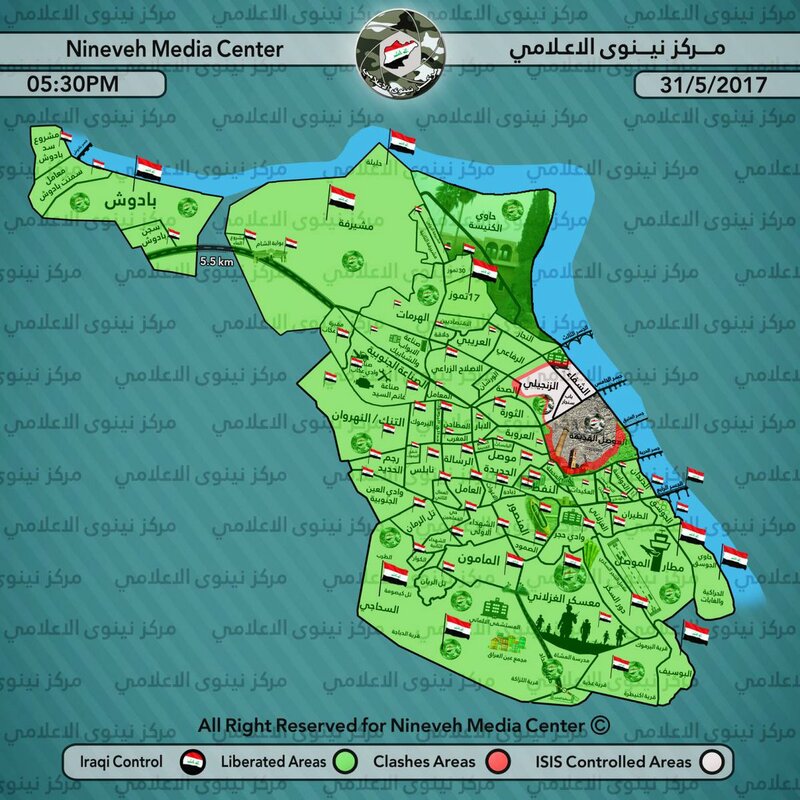 Iraqi Federal Police took control of Islamic State’s training school used to prepare inghimasi (suicide fighters) and raid teams. The school is located in Al-Zanjili district. Four Iraqi soldiers were reportedly killed and a Humvee damaged during the clashes between Iraqi forces and Islamic State in Al-Saha district. Islamic State conducted several raids and attacks against Al-Hashd al-Shaabi in the desert west of Mosul, in the village of Al-Jayir, two Iraqi bulldozers were destroyed by anti-tank guided missiles. The same village was also hit by two IS’ SVBIED attacks, reportedly destroying five bulldozers and three Humvees as well as killing 14 Al-Hashd al-Shaabi’s fighters. Islamic State also attacked the village of Al-Qibat and allegedly killed 15 Al-Hashd’s fighters and destroyed a technical mounted with a machine gun. Iraqi security forces safely detonated Islamic State’s VBIED west of Baghdad, driver of the VBIED was arrested. Amaq Agency claimed Islamic State’s improvised explosive device killed Al-Hashd al-Shaabi’s commander and five other fighters in Qara Tuba area, north of Baqubah. On the 30th of May 2017 CJTF-OIR has conducted 13 strikes in Syria. CJTF-OIR‘s main focus in Syria at the moment is Tabqa-Raqqa-Deir al-Zour region where they did eight strikes supporting SDF‘s operations against IS destroying an IS well head, two fighting positions, a VBIED, a vehicle, and an IS headquarters. Other area where five strikes occurred is Abu Kamal (Al-Bukamal) destroying 12 IS oil stills, two IS well heads, two IS oil separation tanks, and an IS oil truck. Full report on CJTF-OIR strikes conducted in both Syria & Iraq can be found here.